You are preparing a table of sales figues and want to insert the textregistered symbol after one of the product names. In this learning module “ Excel symbol” you will learn how to insert special characters and symbols into Excel. Excel symbol: HOW DOES IT WORK? To insert a special character, first position the cursor where you want the special character to appear. Special characters, symbols and other characters that are not available on the keyboard can be inserted using the excel symbol button in the Symbols group on the Insert tab. Here you will find all symbols available in Excel. If you cannot find the symbol you are looking for, you can change the font or the subset in the relevant drop-down menus. The Subset drop-down menu contains symbols and special characters divided into categories to facilitate navigation. If you cannot see the character you are looking for at first glance, select an appropriate category, Currency Symbols, for instance. Another option to help you find the symbol you are looking for is the Font drop-down menu. Your symbol could be available in a different font. Every font contains symbols and special characters in addition to the standard letters and numbers. If you are looking for a symbol that you have recently used, you will find it in Recently used symbols:. You will see the name of the symbol currently selected here. Click to insert the symbol. The dialog box will remain open so that you can insert several characters consecutively into the text. You will also find numerous currency symbols among the symbols. You should not, however, insert these directly after the values you are using in calulations. If you do insert a special character in this way, Excel will no longer recognize the value as a number and will therefore treat it as text. To prevent this, you should instead apply the appropriate currency format to the cell. You will learn how to do this in the Numbers, Currency, Accounting learning module. 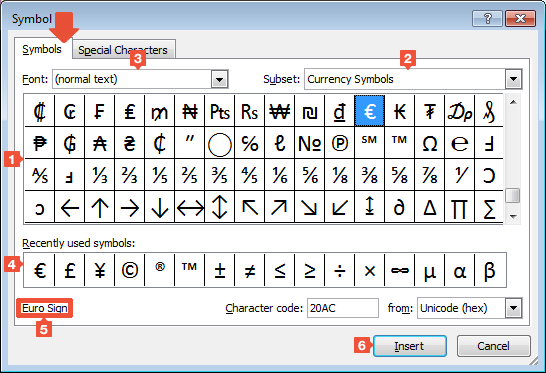 The Wingdings font offers numerous special characters and symbols.